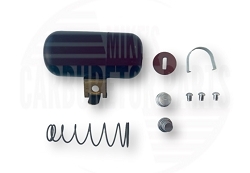 Carter BB, BBR1 rebuild kit, made in the USA from high quality ethanol ready parts. DOES NOT COVER those carburetors with a dash pot. This would be indicated by one or more wires going to the carburetor, or an adjustment screw on the float bowl top. We do have a dash pot type of carburetor kit. DOES NOT fit this type of B&B. Notice the adjusting screw on the top cover. Perfect quality. Everything i need for my 1949 carb is included. Highly recomd this kit. The video covering the rebuilding of the Carter B&B does not show the seal for the step piston being installed, although the kit includes it and notes it in the instructions. Worked fine! Your site us a real find. Would love a shop manual on M37 if you have or know where I could get. Fit my carb perfectly and the videos were easy to follow. Had two rebuilt in the day. Great carb kit for 1941 Dodge Power Wagon. Would highly recommend ! Enough extra pieces were included to fit our 525 Oliver combine/Chrysler engine application. I will certainly call again for future carb kit needs. Q: Does this kit work for a bbr-1 carter carb. 1936 Plymouth p2 coupe ? Q: I purchased your carter model bb bbr1 carburetor kit and on the parts listt do you have the Jet-pump #28that I can purchase? Q: Hello, I have a 1955 Plymouth Savoy with the 230 and three speed. I don't see a carb kit listed for mine. Carb number on the tag is 2063 if that helps, and its a Carter Ball and Ball 1bbl. I see this kit for the BB / BBr1 is close but my accelerator pump dashpot has a slot in the top for the linkage to grab onto. Is there a kit that would work for mine? Thank you for your time. Q: I need a carburetor kit for my Dodge wc51 1942 military vehicle do you have one.? A: I'm sure we do but we would need the carburetor number. To determine the correct carburetor kit we would need the carburetor number. That carburetor came with a small tag attached to the top of the carburetor which included the carburetor number. When that is gone, the only way to be sure of the correct kit is to take the carburetor apart and compare all of the parts with what we have in our photos. We can rarely look at the outside of a carburetor and determine the correct kit. When comparing start, with the carburetor kit that includes your car in the application list with the chance it is the original. Keep in mind that car manufactures often used multiple different carburetors on the assembly line. Carburetor kits care about the carburetor, not what the carburetor is mounted on. Q: I have a Carter BB carb, #D6G1. I have had trouble finding the correct needle and seat assembly. The couple of kits I have looked at offer 2 sets of needle and seats. However, my carb's opening where the seat screws into is slightly larger than the seats in the kits. I bought a kit where everything is correct, except the needle and seat. I ordered a needle and seat from Quadrajets and that one was also incorrect(to small of a male thread size). Are you aware of two different seat sizes for this carburetor? If there is one and you have it, I would love to buy it. If not, maybe someone drilled a larger seat opening on my carb for whatever reason. I am ready to give up. Thank you.